Police in California have issued an arrest warrant for Michael Jackson, Santa Barbara police department said. The singer is in Las Vegas and authorities are negotiating with his lawyer for his surrender, said senior deputy Tim Gracey. 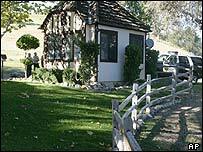 It follows a search of the singer's California Neverland ranch by police in relation to allegations of child abuse. The warrant concerns an alleged violation of a code prohibiting lewd acts with a child under 14. The accusations of abuse are believed to have been brought by a 12-year-old boy. Jackson's lawyers have said that the search on Tuesday was a smear campaign timed to hit the release of the singer's new album. Las Vegas police spokeswoman Tina Ellis said earlier: "Evidently there is a warrant out for his arrest and Santa Barbara police are negotiating with Jackson's attorneys regarding this case." Police in Santa Barbara have scheduled a news conference for 1100 PT (1900 GMT), when further details will be released. Jackson's publicist has said the singer had no idea what the search was about. Jackson, who was not at home at the time of the search, has promised full co-operation. According to US cable channel Court TV, police had the warrant with them as they searched the singer's Neverland ranch, in the Santa Ynez Valley. The warrant is valid in all 50 states of the US, said the channel. "At 8.30 am (1630GMT) Santa Barbara sheriff's department and district attorney's office investigators executed a search warrant at the Neverland Ranch in connection with a criminal matter," said Santa Barbara sheriff's commander Jeff Meyer. Jackson's family lawyer Brian Oxman said the search involved an allegation of sexual molestation. "The search warrant indicates there is an accusation by a 12-year-old boy who says that he was molested and the police are seizing information which they think is relevant to that accusation," he said. He added that the warrant indicated that the investigation had been going on for two months. However, Stuart Backerman, the pop singer's Los Angeles publicist later issued a statement denying any knowledge of the allegations. "We cannot comment on law enforcement's investigation because we do not yet know what it is about," Mr Backerman said. "Michael will, as always, co-operate fully with authorities in any investigation even as it is conducted, yet again, while he is not home." He accused a "rogue's gallery of hucksters and inside sources" who dominated the airwaves on Tuesday speculating on the investigation. "These characters always seem to surface with a dreadful allegation just as another project, an album, a video, is being released," he said. The police raid came on the same day that a greatest hits collection featuring Jackson's new single, One More Chance, was released. Dr Carole Lieberman, a US psychiatrist and child welfare lawyer, told BBC One's Breakfast programme that Jackson was "an accident waiting to happen". "I warned child protection services in November and February, concentrating on his not being a fit father and saying his children should be taken away until he gets psychiatric treatment," she said. Jackson's friend, the psychic Uri Geller, described the singer as "extremely gullible and very naive". 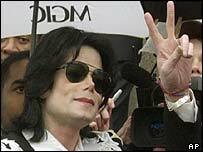 "Michael sets himself up for these type of allegations and rumours," he told BBC Radio 4's Today programme. "He doesn't understand that he is living in the world of a child and doesn't understand that in today's society this is wrong." Nine years ago, a 14-year-old reached an out-of-court settlement in a lawsuit over sexual abuse allegations. No criminal charges were ever brought. In November last year, he stunned fans in Berlin by dangling his baby from a hotel window. Who speaks for Michael Jackson?